Yes, it’s great for emergencies–it’ll jumpstart a car, forex–but it’s the camping applications that make me love it so. Y’see, the usual writerly camping trip tends to revolve around plotting and editing, with some handwritten first drafting. Truly, I love writing by hand, and part of me misses the days when I wrote first and second drafts with black extra-fine Uniball pens on college-ruled notebook paper in a three-ring binder. But… I’ve also grown accustomed to the greater speed a keyboard allows me when my thoughts start running ahead of my cursive. Most of you have stuck with me for an entire year now, and I can’t tell you how much your support and faith means to me. I’m enough of an introvert that I don’t experience writing and creating as particularly lonely endeavors, but they can certainly be fertile ground for bouts of doubt and anxiety. We’ll still get an Article of Violence this month, but I also wanted to do something extra for you. Thus you have a story–not a holiday story, precisely, but one of and for the heart. In self-defense, hesitation can kill. We’ve talked about that One-Mississippi before, yes? Waiting to act—even when that wait is a natural “Is this really happening?” moment—can mean the difference between striking before the attacker grabs, or having to fight with a bleeding head injury. It can mean the difference between an escape made on your feet or fighting a losing battle the ground. That push against hesitation must be balanced against circumstances, though. If a drunk gets handsy with me in the pub, I shouldn’t hesitate to stop him… but I should not slam the ridge of my hand against his throat, gouge out an eyeball, and stomp his ribcage until I puncture a lung. was not as enthusiastic about MileHiCon this year for a couple admittedly ego-centric reasons, and because I was tired and had had such a wonderful and unique Sirens experience. But I’d made commitments, and so I went. At the SFWA meeting, I in-person connected with Nathan Lowell–a wonderful indie writer I’d communicated with online, and waved to once at another local con. We chatted until needing to run off to respective panels, then met up again for whiskey in the afternoon. Eventually we were joined by three other writers–indie writers!–from Rocky Mountain Fiction Writers, and I much enjoyed the three-ish hours we all spent together sharing experiences and encouraging more connections. There were dog stories, too, which makes everything more wonderful. So now I’m looking at connecting with Rocky Mountain Fiction Writers, joining their indie publishing group, and picking brains about audio books and the like. And I’m looking at enjoying it. As for NaNo… I’ve mentioned elsewhere I’m not doing the “real” NaNoWriMo. Truly, signing up on yet another website, proving my wordcount, and so on does not appeal to me. Besides, I’m starting with a pile of already-written material that will be shuffled in with newly written material, and methinks that’s not in the NaNo rules. But for the first time ever, the month of November is one during which I can give writing more time and focus because I do not have children at home, holidays with family do not require extensive travel, and my son’s early December birthday doesn’t require much planning. Thus I’m doing the nose-grindstone thing for thirty days. 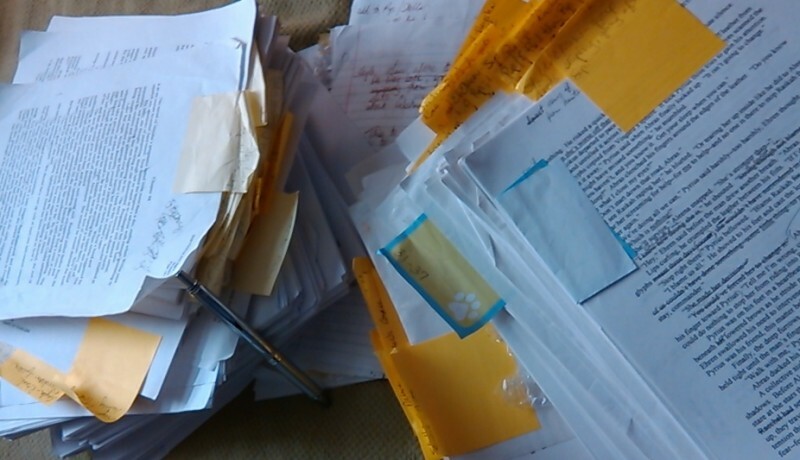 Most of that will end up trashed or set aside for another novel, since it was first written years ago. Today’s task is to shuffle through those piles and pull out all the pieces I might want to use going forward, to integrate those pieces with the existing multiple-viewpoint outline, and translate those pieces onto the Magic Index Cards that will permit me to write the novel. In other news, I’ll be making three frittatas and homemade caramel for apple-dipping so we can have a Halloween family dinner + trick-or-treat this evening.